PowerPoint is a customizable and animated presentation software by Microsoft and is bundled together with other Office 365 applications. It can be used for personal reasons, for academic and business presentations. 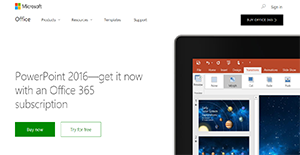 PowerPoint 2016 comes with pre-made presentation templates and color schemes. They are customizable to fit a user’s preferences and together with custom themes, can support slide and object animations and sound effects, images and graphics, and built-in presentation notes. With PowerPoint 2016, individuals have the power to make a sleek, professional presentation or a personalized, engaging presentation. These files are then automatically synced into the OneDrive cloud storage, where it can be easily accessed and shared with a user’s teammates or colleagues. PowerPoint 2016 is mainly used on PCs and Macs but it also has native mobile apps for Android, iOS, and Windows phone and tablet users. This makes the software portable yet still functional and powerful and enables users to create presentations and rehearse using them before they appear in front of an audience. PowerPoint 2016 comes with templates with preset color schemes. But this should not stop users from customizing them or creating their own themes. On top of that, they can make their slides more engaging to further captivate their audience by adding animations and sounds, pre-recorded narrations, and more. With PowerPoint 2016, presenters can highlight important points during their talk. They can do this via the application’s zoom feature, which lets them zoom in and zoom out on a section of the slide and makes their presentations more fun. With PowerPoint 2016, users can talk in front of an audience with confidence. The application shows the slides on the public screen while the user is able to view their notes and the upcoming slide on their own computer or device. PowerPoint 2016 files can be saved on a user’s OneDrive account. This makes them accessible anytime to the user and also lets them share their presentations with their colleagues through the cloud by sending them links. On top of that, this lets them work together on a presentation via PowerPoint online. Since each company has unique business needs, it is sensible for them to desist from seeking a one-size-fits-all ideal software application. Needless to say, it would be pointless to try to find such a platform even among market-leading software solutions. The intelligent thing to do would be to list the various vital aspects that require consideration such as key features, finances, skill levels of workers, company size etc. Then, you should do your homework thoroughly. Read some PowerPoint reviews and investigate each of the other solutions in your shortlist in detail. Such comprehensive homework can make certain you reject ill-fitting platforms and choose the solution that offers all the aspects you require for business success. How Much Does PowerPoint Cost? We realize that when you make a decision to buy Collaboration Software it’s important not only to see how experts evaluate it in their reviews, but also to find out if the real people and companies that buy it are actually satisfied with the product. That’s why we’ve created our behavior-based Customer Satisfaction Algorithm™ that gathers customer reviews, comments and PowerPoint reviews across a wide range of social media sites. The data is then presented in an easy to digest form showing how many people had positive and negative experience with PowerPoint. With that information at hand you should be equipped to make an informed buying decision that you won’t regret. What are PowerPoint pricing details? What integrations are available for PowerPoint? Pros: I’ve been using PowerPoint for more than 15 years, and I have seen great improvements since the beginning. I have to say that the latest version of this program includes Design Ideas. I like that those designs follow similar principles to SmartArt Graphics. You can make the presentations even more effective and more professional-looking. Its image editing tool makes it easier to crop, colorize and adjust brightness to the images. Cons: IN my opinion, newbies may need some time in order to learn this product. In addition, this program offers traditional slide format for presentations but other software similar to this one use a canvas approach, I really like canvas approach. Pros: I like the Idea that PowerPoint shows up into animation department, I’m using another software along with PowerPoint but I have to say that this one is used by everyone in my company. They know they can easily create presentations by using PowerPoint, it is familiar tool to everyone. There is even an option to buy a license or to pay monthly. Cons: I don’t like the interface! I have to go around in order to find things. I’ve been using PP for long but I still struggle when trying to find some tools/options. In addition, there is no way to embed fonts on a Mac therefore I have to email my clients so I can send them links that is used within the presentation. It needs some improvements.